Looks like quality work, like the colors, well done! The iron sights co-witness properly? It's Burnt Bronze. It really pops in the sunlight. And no, the sights do not co-witness. BTW, those sights are Dawson's. Did they provide the cover plate? If not co-witnessed, iron sight usable in any ways with RMR mounted? Dawson's sight? Is that what came with? I though the slide comes with a similar but different brand. I would also like to know if it come with a cover plate as is I had the work done it would be sometime before I would get something to go on it. Palmetto State Armory had them on sale for $369.99 briefly. I ordered one and now TEMPORARILY OUT OF STOCK. @Doc44ga -Yes I plan to shoot it in competition. Mainly in IDPA due to the ridiculous rules of USPSA, but some USPSA too. @Kost -Thanks! The sights do not co-witness. The Dawson sights (I swapped out the LPA sights) are for if I want to run it without the RMR. @gpark09 and USP/P30-The cover plate was $35 and another $20 to Cerakote it. It is their Glock cover plate but it works nicely. I took it to an indoor range today to zero the RMR, then went to an outdoor range and shot some steel. This is my first red dot pistol and I'm really liking it. It is SO much fun to shoot. To say I'm impressed is a total understatement. The VP9L ran flawless and the accuracy, well it is simply ridiculous! I shot about 30 rounds of Federal Syntech 150gr sighting in the RMR and the groups were amazing. 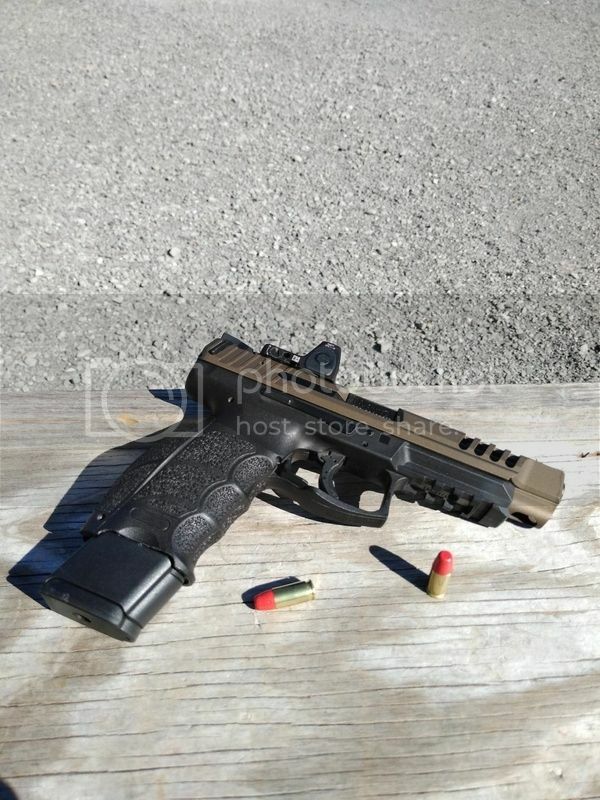 I shot it off a bench with the front of the pistol rested on a sandbag. 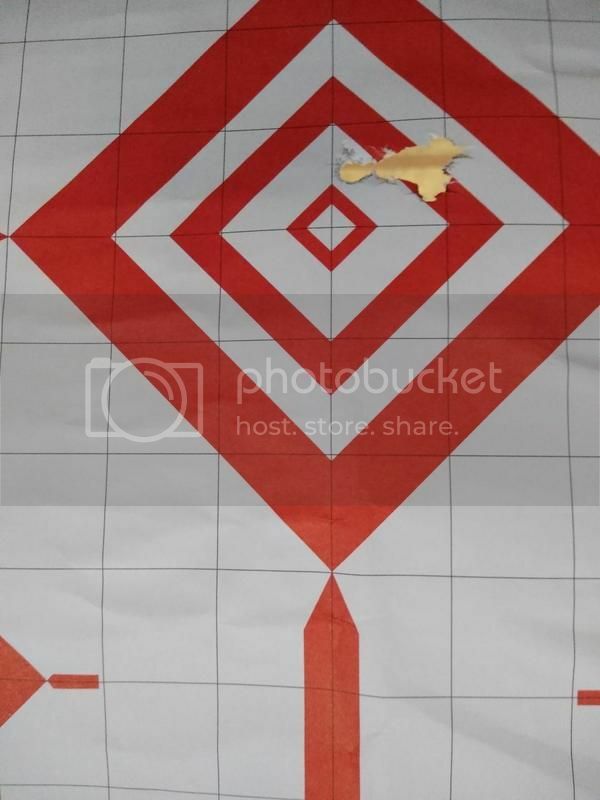 The group in the picture below is 6 shots at 25 yards and it measures 0.90 inch! And that was not the exception; of all the groups, the largest was 1.5 inches at 25 yards. Maybe the O-ring does make a difference; I mean this thing can out shoot custom 1911's! Simply an awesome pistol; you get more than what you pay for with an HK. Nice shooting. Maybe the o ring has something to do with it. It looks great. My VP9 Longslide is at Primary Machine right now being milled for an RMR. I went with the graphite black cerakote. Seeing your I kind of wish I’d went with Burnt Bronze. Do you think the factory adjustable rear sight would be tall enough to use with a taller front sight, with the RMR installed? I’d like to have iron sights as low as possible to avoid cluttering up the view thru the optic. The suppressor sights look way to tall. Why? Is it too heavy to hold? What is o-ring? And why is it important. Is the red dot sight better than laser pointer?